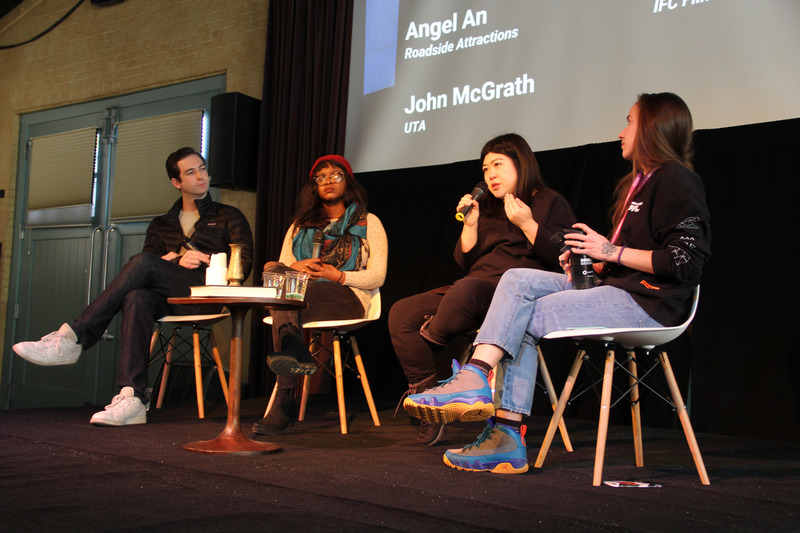 Film industry professionals working in film acquisitions and talent agencies shared their expertise with a crowd of Adobe Sundance Ignite fellows, scholarship recipients and young filmmakers at the Sundance Film Festival in Park City, Utah on Jan. 31. Powered by Adobe and the Sundance Institute, the panel discussion between three film industry professionals was facilitated by Jess Fuselier, manager of education and research at the Sundance Institute’s Creative Producing Program. As it’s difficult to figure out what type of content people want to consume, Fuselier said, the panel discussion aimed to offer perspectives of people working in the industry to help the group of aspiring filmmakers navigate their journeys. Angel An, senior director of acquisitions at Roadside Attractions said that directors who have consistently made good movies are the ones with a particular view of the world and have something they want to get off their chest. An discussed the utmost importance of a film’s quality. She almost always acquires finished films only, because the quality of a film isn’t usually something that can be predicted based off a first-time filmmakers script, she said. “Every film is a journey and that journey can sometimes go zigzagging all kinds of different ways — you can’t predict the end results often times,” An said. As far as the type of content An looks for, it’s the “good kind,” she said through a laugh. “Quality is a major motivator for folks to go out to the movie theaters. You have to maybe hire a babysitter, pay for parking, get a dinner beforehand, so what you’re watching sitting down, spending two hours in the dark for, really has to be worth it,” An said. Even with the demographic of regular movie-goers, the older generation has a habit of seeking out specialty releases of films with interesting plots with amazing reviews, so An looks to acquire films that fall under those factors. “We always emphasize on a willingness to entertain, which means we support artists and want to distribute content with a point of view,” An said. Aijah Keith, director of acquisitions and production at IFC films spoke about her journey getting into the film industry. When she was in college, she didn’t realize that working in film was a viable career path for her, she said. “I always loved film, just didn’t realize that was something I could do,” Keith said. After taking as many film history classes as she could, Keith pursued a career in the film world. She got her first internship at IFC films, where she works today as the director of acquisitions and production. In first finding her footing in film acquisitions, Keith realized the importance of understanding and trusting her own taste. “It became really important for me to figure out what my tastes were, not what my boss’s tastes were, not what the film critic of the New York Times’ taste was, and go with that, because that’s something that’s unique to you and something you can market yourself,” Keith said. United Talent Agency Coordinator and Sales Agent John McGrath addressed the stereotype that everyone who works in Hollywood is rude. McGrath said that sometimes people think they need to be aggressive to stand up for themselves, but they should work to be building bridges, not burning them. An stressed the importance of what the real goal of working in film is.